We can install horizontal and vertical sun control devices in multiple configurations to add an impressive design feature to your building while allowing control over the amount of sunlight in the room. Horizontal & vertical aluminum sunshades can be anchored to a glazed curtainwall, masonry or other building facade. We can also do retrofit installations on existing structures. Horizontal shading can be provided as a cantilevered unit with projections ranging from 1’-6” to 4’-0” from the face of building. Sun control units are available with multiple arm and blade designs. Single blade sun control systems, installed at an angle specified by customer, can be installed in horizontal or vertical applications and typically range in depth from 6”-12”. There are many choices for single blade designs ranging from elliptical blades that are angled to catch the sunlight, to fixed rectangular cover extrusions that snap directly onto the curtainwall system. Aluminum Architectural louvers are often used in window systems where air flow is needed for air conditioning systems, fresh air intake or exhaust, or for an architectural element to hide mechanical equipment. Louvers are made from aluminum or steel using blade-type extrusions designed to drain water and allow air flow. Exterior architectural louvers are typically stationary but can also be configured to open and shut mechanically to adjust air flow. Louvers can be made in several different depths using different shapes of extruded aluminum blades such as flat, round, square airfoil or a combination of these. 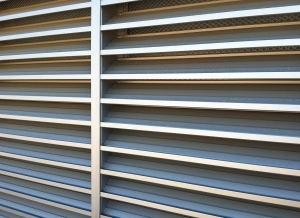 Many louvers incorporate lank off panels and/or screening as part of the assembly for energy performance. Flower City Glass has incorporated louvers as part of our expertise for many years. 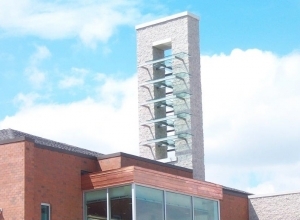 We have the experience in providing louvers for many different applications and know how these systems should be installed into a building the right way.